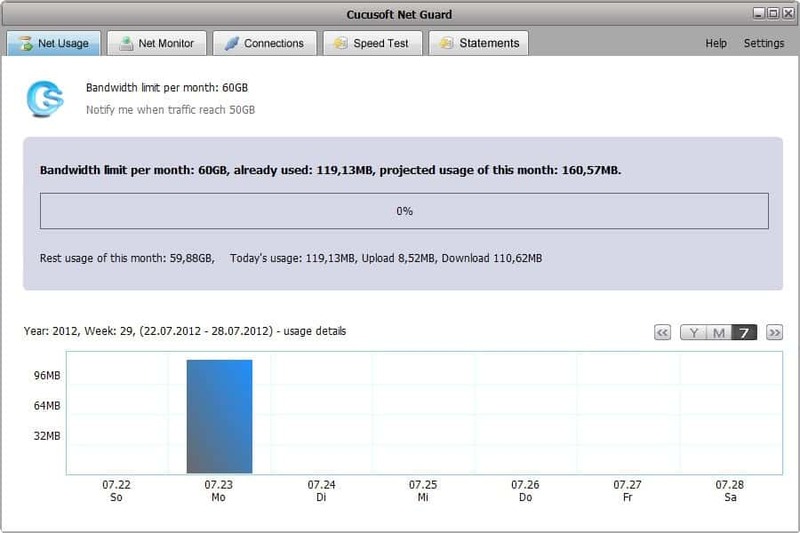 Monitoring the bandwidth usage of a computer system can be beneficial in several ways. You can use the data to make sure you stay under a monthly limit, which may be very helpful if you are on a limited plan that is only providing you with a set amount of free traffic per month. A bandwidth monitor furthermore can also be helpful when you are auditing your PC, for instance to find out which programs and services go online. Cucusoft Net Guard is a free program for the Windows operating system. You can download it freely from the developer website but need to enter an email address during first run to receive a serial number that you need to enter to use the program at all. Once that is out of the way you will notice the small upload and download realtime widget that is added just above the Windows system tray area. A click on the widget expands it displaying statistics about the day's Internet usage. This includes the overall bandwidth used, the upload and download bandwidth, and the programs that top the upload and download bandwidth statistics for that day. Note: Pay attention to Netguard's installation dialog, as you may find third-party offers included in it that are not necessary for the program's core functionality. If you do not want those installed, make sure you select decline or skip to do so. You can hide the floating window and only use the main application window instead which you can open from the operating system's system tray area. Net usage displays the bandwidth usage over time, as well as how much of a month's bandwidth limit you have already used up. You can define Internet limits in the program settings. The graph can display bandwidth usage by week, month or year. Net monitor displays all processes and services that are or have used the Internet connection in one way or the other. Each program is listed with its name, the current upload and download speed, as well as the traffic that it has accumulated in the current session. A right-click on a program displays options to kill the process directly. Connections displays a list of ports that are currently open on the computer. Speed test runs a benchmark that is used to determine the computer's download speed. It is fairly limited in comparison to other services such as Speed Test, Down Tester, Internet Auto Speed Tester or Speed.io. Statement displays a computer's bandwidth usage in a pdf report. If you are interested in the monitoring aspect only, then Net Guard is an excellent program for that job. It's memory is definitely on the high side though and alternatives like Netmeter or Open Monitor may be more suitable for low-memory systems. If you want to control the upload and download speed of a process as well, then you should take a look at NetBalancer Free instead which can do exactly that. Still love and prefer NetWorx. I agree, it is a great network monitoring software. I prefer Network Monitor above NetWorkX maybe because I use my taskbar in the sides of my desktop instead of bottom as usual. Using Rainmeter to monitor my monthly download usage as i’m on a 40GB monthly limit. ^Way to be classy with the nickname. It hasn’t been updated for a while, but it’s stable as a rock, and the interface is extremely intuitive and looks great in my system tray (Windows 7 64-bit). 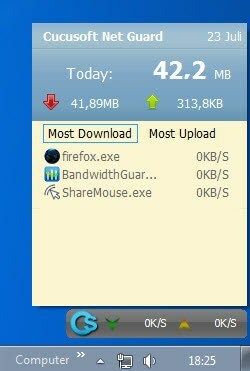 I can tell at a glance whether something is downloading, uploading, or both. Aside from the bandwidth monitor denoted in this article could anyone recommend me a bandwidth monitor software that is oriented toward ‘actively’ (not passively) monitoring upload/download activity of programs/applications, an additional perk feature that I would also appreciate is if this software can also monitor the bandwidth usable of the router in general. The reason I am looking for a software like this is due to the occasional degradation in upload/download activity of all the programs on the computer that I am on, I’m very much interested as to why this occurs; whether lousy ISP is skimping on its advertised bandwidth speed again, whether most of the bandwidth traffic is being prioritised by a single or a couple of programs, or whether another computer connected to the network is leeching bandwidth away from the computer that I am currently connected on. I would really appreciate it if anyone could give me any sort of recommendation (a good one). Do NOT install this software – it never uninstalls, and if you disable the zombie service it kills your internet connection.